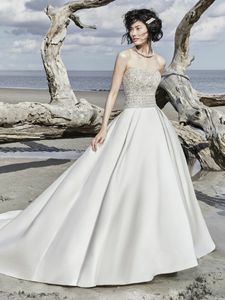 Description: An elegant princess wedding dress with unique touches, this Carlo Satin ballgown features a bodice of beaded embroidery and Swarovski crystals. Complete with strapless scoop neckline. Finished with crystal buttons trailing from zipper to hemline.